Happy Thanksgiving and Good Wishes To Our Troops!Eliminate The Muda! Thanksgiving is a time to reflect on all the things we should be thankful for. Your God, your country and your family. Please take time out of your day for all of these and please say a prayer of thanks for our troops! Have a happy Thanksgiving! 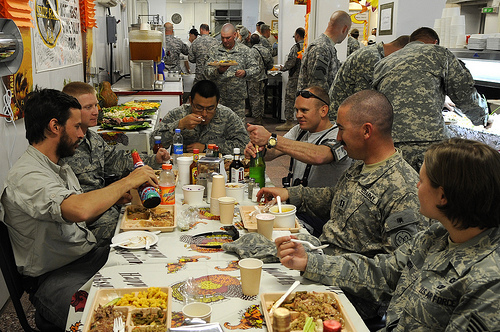 HERAT, Afghanistan – Deployed Army, Air Force, and Navy service members, as well as U.S. civilians and international militaries, share an American Thanksgiving meal at Camp Stone near Herat, Afghanistan. More than 30 turkeys were prepared and served alongside mashed and sweet potatoes, corn, green beans, macaroni and cheese, pumpkin and pecan pie, and a variety of beverages including eggnog and sparkling grape juice. The holiday drew more than 500 American service members from nearby international camps where a Thanksgiving meal was not provided.